HUBERT, JEAN-FRANÇOIS, bishop of Quebec; b. 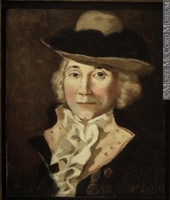 23 Feb. 1739 at Quebec, son of Jacques-François Hubert, a baker, and Marie-Louise Maranda; d. there 17 Oct. 1797. 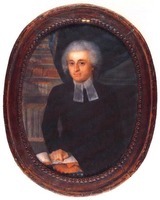 Jean-François Hubert was educated at the Petit Séminaire de Québec and then in 1755 began theological studies at the Grand Séminaire. In the summer of 1759, when Quebec was under siege, he took refuge at the Sulpician seminary in Montreal where the most advanced students of the Séminaire de Québec had been brought together. There he continued to study under the direction of Abbé Colomban-Sébastien Pressart. In October 1759 Bishop Pontbriand [Dubreil*] also came to the seminary in Montreal where he again encountered Hubert; Hubert had previously served as the bishop’s secretary and he resumed these duties. 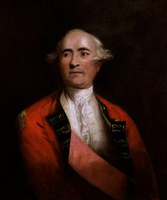 In the spring of 1760 Pontbriand conferred minor orders on him. At his death in June the prelate bequeathed 300 livres to his young secretary. The following year Hubert was one of the first students to return to Quebec, and when the seminary reopened on 15 Oct. 1762 he resumed theological studies. Hubert, who had become secretary to Vicar General Jean-Olivier Briand in 1761, had to wait until Briand returned from London as bishop before he received major orders and then, on 20 July 1766, the priesthood. He was the first priest to be anointed by the new bishop. Devoted to his former teachers and drawn to the missionary ideal of the Séminaire de Québec, Hubert had long sought acceptance into the seminary. He had held the office of bursar since September 1764, and on 7 Aug. 1765 was admitted to the community. During his years at the seminary Hubert would carry out numerous important tasks, while at the same time teaching philosophy and theology and also continuing as Briand’s secretary for some 12 years. In the autumn of 1765 he was a director of the Petit Séminaire, at the time when that institution took over from the Jesuit college the responsibility for secondary education and began offering it to all young men who wanted it, not just to those intending to become priests. On 26 April 1768 he was admitted to the seminary’s council and on 20 August was appointed a director of the Grand Séminaire. 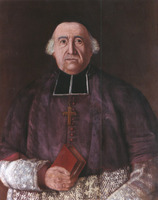 Bursar of the seminary from 1770 to 1777, in 1773 he was again a director of the Petit Séminaire. The next year, on 3 December, he became the first Canadian superior of the Quebec seminary. 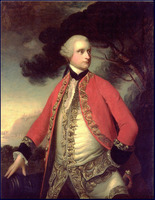 In choosing a Canadian its members had probably taken into account the desires expressed by Murray when he was governor, as well as by the British authorities, who clearly favoured the Canadianization of the clergy, hoping in this way to hasten the breaking of all existing ties between France and the Canadians. Hubert had probably conceived the idea of devoting himself to the missions through his association with his bishop, and Briand naturally rejoiced in his former secretary’s decision. In September 1781 Hubert left his parish charge of Sainte-Famille to fill the gap that Pierre-Philippe Potier’s death had left in Notre-Dame-de l’Assomption near Detroit; he had visited the parish when he travelled to the Illinois mission. Governor Haldimand had furnished Briand’s vicar general with a letter of recommendation couched in flattering terms. 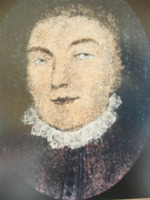 Hubert served the parish until 1784, building a new church and presbytery and taking an active role in educating the young. In September 1784 he wrote to his bishop: “I should like to be able to reform morals as easily as one can rebuild a presbytery; but alas, how many obstacles there are!” Soon after, Hubert learned of his appointment as coadjutor to the bishop of Quebec. Bishop Briand had long been thinking of resigning from office. His health left much to be desired, and his coadjutor, Louis-Philippe Mariauchau d’Esgly, was very old; there was great danger that the two bishops would have no successor. On 29 Nov. 1784 Briand resigned in favour of d’Esgly. The delicate question of the choice of a coadjutor had to be faced, and it was important that a young, dynamic priest in good standing with the government be appointed quickly. On 30 November d’Esgly and Briand jointly recommended Jean-François Hubert to the Holy See and signed the act of nomination, on condition that Hubert meet with the approval of London and the authorities in Rome. The clergy, prominent figures in Quebec, and several members of the Legislative Council praised this judicious selection. 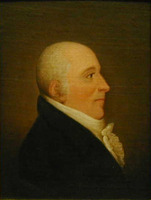 London, however, was to wait two years before accepting the choice: Haldimand, displeased that Briand had waited for him to leave before resigning, thereby depriving him of a say in the choice of a coadjutor, had intervened, favouring two English monks, a Dominican and a Recollet, for the vacant office in the see of Quebec. 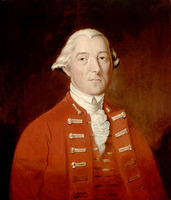 On 30 April 1785 Lord Sydney, the Home secretary, informed Lieutenant Governor Henry Hamilton that the office had to be offered first to the superior of the Sulpicians. In July 1785 Étienne Montgolfier refused it for various reasons, one being his advanced age. Rome had sent the bulls naming Hubert bishop in partibus of Almyra and coadjutor of Quebec, and d’Esgly received them early in June 1786. Approval by London, which was slow in coming, followed shortly upon the arrival of the new governor, Lord Dorchester [Guy Carleton*], and on 29 Nov. 1786 Hubert was consecrated bishop by Briand in the cathedral of Quebec. Scarcely had he been appointed coadjutor when Hubert undertook the first full visitation of the diocese to be made in 15 years. In 1787 he confirmed more than 9,000 people in the District of Montreal alone. The sick and aged d’Esgly, who remained in his parish of Saint-Pierre on Île d’Orléans, could in all tranquillity have left things to his coadjutor. However, his intransigence and his desire that nothing be done without his permission created a number of problems for Hubert and for Vicar General Gravé de La Rive, who were often obliged by circumstance to take decisions without consulting their bishop. In April 1788 d’ Esgly threatened Gravé with severe penalties, even going so far as to withdraw his powers as vicar general. Hubert took Gravé’s side, while Briand, who was distressed “to see the peace disturbed in this poor church of Canada,” exhorted the coadjutor to be patient and advised him to treat his bishop with deference. On 4 June 1788, when Bishop Hubert was on a pastoral visit in the region of Saint-Hyacinthe, d’Esgly died. 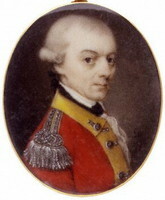 Hubert returned to Quebec immediately and took possession of his see on 12 June 1788. The freedom the Canadian church enjoyed was in fact highly relative. Despite certain compromises London had not given up the exercise of its right to keep a vigilant eye on the church, indeed to keep it under its thumb. 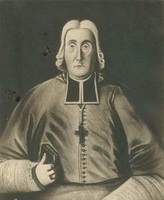 This limitation was not unknown to Hubert, who later, when writing to the prefect of the Sacred Congregation of Propaganda to suggest that the diocese of Quebec be split, remarked that “on this subject, as on many others, we in Canada are forced to innumerable precautions.” He envied the bishop of Baltimore, John Carroll, his liberty of action, since it was entirely within Carroll’s discretion in 1791 to entrust the administration of his seminary to Sulpicians who had come from France. “In the United States of America, there is a church that is becoming established with brilliant success. The Congress is protecting it. Is this for [any] motive except those of politics? Not so, but by the consent of Providence who employs all things to accomplish His eternal purposes.” The bishop had nevertheless adapted himself to this not too uneasy situation, to the point that in November 1792 he wished the superior of the Missions Étrangères in Paris “as happy a lot as ours in this country, where we enjoy, at least on the government’s part, liberty for our holy religion, without worry and without dissension.” However, his fears of witnessing both the subjugation of the Canadian church and the Protestantizing of the Canadians by London would be aroused again with the arrival in Quebec of the Anglican bishop, Jacob Mountain*, in 1793. One of the new bishop’s first tasks had been to fill the office of coadjutor. 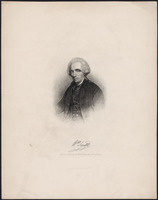 Just as he had designated d’Esgly in 1770, so Dorchester now imposed Charles-François Bailly de Messein, the parish priest of Saint-François-de-Sales at Pointe-aux-Trembles (Neuville), who was nicknamed “the parish priest of the English.” Known for his pro-British sentiments and held in esteem by the governor – he had been tutor to his three children at Quebec and then in England – “the Château’s bishop,” as Bailly was called, was consecrated on 12 July 1789. Hubert, who was well acquainted with the sensibilities and “the extreme touchiness of the British government,” had thought it wise not to object. He had, however, taken care to warn Bailly that he did not intend to entrust him with any specific task or “to lay down in any way the burden that Providence alone” had laid upon him. Bailly did not take kindly to the rather unobtrusive role to which Hubert had condemned him. 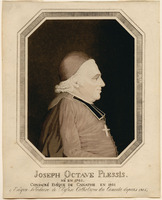 He publicly opposed his bishop in the Quebec Gazette on 29 April 1790: he complained in the name of the clergy about a pastoral letter of 10 Dec. 1788 that restricted the jurisdiction of the priests of the diocese and he blamed his bishop in the name of the citizenry for maintaining too many public holidays, to the detriment of the rural Canadian populace. The split between the bishop and his coadjutor was public, “something that had never been seen in the church of Canada,” wrote Hubert to Cardinal Antonèlli. The Montreal Gazette supported Bailly on this occasion, but Briand and the Canadian clergy publicly disavowed the coadjutor bishop. Believing in a church free from political pressure, Hubert always endeavoured to strengthen the Canadian church and to establish relations of friendship and absolute confidence with his clergy and the faithful. At the beginning of his episcopate he wanted to convoke a synod at Quebec but had to abandon the idea because of the governor’s opposition. He also early considered splitting his diocese, which was inordinately large, by creating a bishopric in the District of Montreal. But apart from the possibility of government opposition, the conduct of his coadjutor, who was a likely candidate for this bishopric, postponed the execution of this project. Because of his concern for the religious education of the Canadians, who were being increasingly tainted with “impiety” and “the spirit of independence,” he encouraged several movements, including the Congrégation des Hommes de Notre-Dame de Québec; indeed upon Augustin-Louis de Glapion’s death in 1790 he took charge of that organization. The well-being and material circumstances of the clergy also engaged Hubert’s attention and in 1796 he took an interest in the creation of an ecclesiastical fund to provide for the needs of priests who were “worn out or ill.” Believing in order and efficiency, Hubert asked that his letters be transcribed into a special notebook, contrary to the practice of his predecessors who had merely summarized their most important letters on loose sheets. In so doing he initiated the series of registers of correspondence which has continued until the present. One of the most important of the many problems with which Hubert had to deal was the scheme to establish a university for Catholics and Protestants. This project was to bring the bishop into conflict with his coadjutor Bailly and cause a sensational incident, which was taken up in the newspapers. On 31 May 1787, in view of the lamentable state of education in the province, Dorchester set up a special committee to investigate all aspects of teaching. Chaired by Chief Justice William Smith, this commission had nine members, of whom four were Canadians. On 13 Aug. 1789 Smith sought the advice of the bishop of Quebec and of Bailly about the establishment of a mixed university at Quebec. Hubert made known his response in a long memoir dated 18 November in which he expressed the opinion that such a project was premature; he emphasized in particular the limited number of students for the professors and the Canadians’ general lack of interest in university studies. Hubert also posed several questions. On what level was the proposed new institution to be set up? Who was going to take charge of it? Who would appoint the director? What role would the bishop of Quebec be called upon to play in it? Who exactly would be the “men without prejudices” to be put in charge of the institution as protection for both Catholics and Protestants? Was it not better to support and promote the two existing colleges in Quebec and Montreal and, using the income from the Jesuit estates, to facilitate the reopening of the Jesuit college, which could later be raised to a university? The bishop, like Briand earlier, considered himself the natural guardian of the estates and thought he alone was capable of both utilizing them and making them bear fruit in accordance with the donors’ intentions. The coadjutor’s reply to the commission’s questionnaire was quite different. 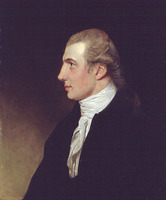 On 5 April 1790, four months after the investigating committee had completed its report and adopted a series of resolutions to present to the governor, Bailly sent Mr Justice Smith a long statement, in which he came out in favour of the project and refuted one by one his bishop’s arguments. Some months later, in October 1790, Bailly made his letter public. The clergy of the diocese and most of the leading citizens took a stand in favour of Hubert on this occasion, just as they had supported him in May 1790 during the controversy between the two bishops over the reduction in the number of public holidays. 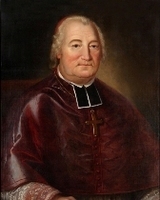 The dispute with Bailly was referred to the authorities in Rome, who pronounced in favour of the bishop of Quebec. Bailly was to make his peace with his bishop at the time of his death on 20 May 1794. The project for a non-sectarian university at Quebec, which was so dear to Dorchester’s heart, was not followed up, despite a request presented to the governor on 31 Oct. 1790 by 175 prominent French and English speaking citizens of the province of Quebec and an important legacy from Simon Sanguinet for the founding of such a university. Hubert had not wanted to become involved in a project which, according to him, could have been disastrous to the Canadian people and which, in his view, on the whole presented no guarantee for his compatriots’ language and faith. Not that the bishop distrusted the governor’s intentions. He considered him “a man without prejudices against Catholics and full of kindnesses for the Canadians.” Besides, Dorchester was thinking less of subjugating the church than of entrusting to the state a leadership role in the field of education. But for Hubert teaching was a responsibility of the church, not the state. For his part, Bailly had expressed the opposite view: the projected university was a responsibility of the state, which offered equal guarantees to Catholics and Protestants. Hubert was to claim that the frustrated ambitions of his coadjutor had led to this difference of opinion with him; he was probably not entirely mistaken. But the coadjutor bishop, who had been educated at the Collège Louis-le-Grand in Paris, who read the philosophers of his time and was accustomed to frequenting the English Protestant environment in London and Quebec, showed a rare open-mindedness by his stance. In short, the problem of the denominational school, which would not soon be resolved, had arisen for the first time. Bishop Hubert’s attitude, which prevailed at that period in the Canadian clerical milieu, constituted a condemnation of the ideas of the French revolution. He was probably afraid that the projected institution would become the vehicle of ideas hostile to religion and authority. Hubert noted in October 1792 that Canada “is not entirely sheltered from the spiritual evils that afflict Europe. A prodigious number of bad books have come into this country, and with them a spirit of philosophy and a mood of independence which can only have dire consequences.” The bishop must have had in mind the struggle against religion, the clergy, and the nobility in which the Montreal Gazette and its founder, the Frenchman Fleury Mesplet, were engaged. The struggle against the revolutionary ideology was accentuated by the arrival of French royalists who had been driven from their country by the revolution. From 1791 on, 51 émigré priests came to Canada; 40 stayed here, including 18 Sulpicians. Although their numbers were small, they were nonetheless of great importance. Before 1790 Canada had received only a handful of French ecclesiastics and at that time had only 146 priests; this number increased by nearly a third in the space of ten years. The French clergy would win renown in the Acadian missions and in the church in Canada, where it would play an important spiritual and cultural role [see Jacques-Ladislas de Calonne*; Louis-Joseph Desjardins*, dit Desplantes]. At the very time when the Canadian church was approaching a period of austerity which would not come to an end until shortly after 1837, these priests gave the church its second wind. The bishop of Quebec would have liked to receive more émigré priests in his diocese. He had several times unburdened himself on this subject to the bishop of Saint-Pol-de-Léon (France), Jean-François de La Marche. “An `unconstitutional’ priest from France, who is hostile to the oath . . . [to the Civil Constitution of the Clergy] and the principles which engendered it, is always welcome in Canada.” He had not been afraid to receive with open arms these “zealous and fervent workers,” at the risk of displeasing the Canadian clergy, who did not always look favourably on the arrival of the foreign priests. But as long as the diocese could not meet its own needs, Hubert had to act as the protector of the émigrés. “Let us get rid of a certain national prejudice; let us adopt a broader and more liberal point of view; let us prefer the general good of the faith to personal views of [our own] interest, and there will not be so much opposition to strangers who are seeking a useful and honourable refuge,” he wrote. 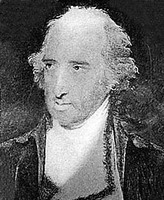 Bailly’s death in May 1794 again raised the problem of the appointment of a coadjutor. On this occasion Dorchester presented a list of three names to Hubert, who chose Pierre Denaut*, parish priest of Longueuil and since 1790 vicar general. Denaut was consecrated bishop in Montreal on 29 June 1795. Soon after, in July, Hubert left on a pastoral visit to the Baie des Chaleurs region, despite the fears of those close to him. He came back worn out and seriously ill. The following year he was unable to proceed with his plans to go to Halifax. His health worsened. 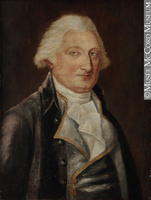 After several stays in hospital, he resigned his office on 1 Sept. 1797 in favour of his coadjutor. He was named parish priest of Château-Richer, but spent barely two weeks there before he was taken to the Hôpital Général in Quebec, where he died a short time later, on 17 October. AAQ, 12 A, C, 111; D, 55v, 60v, 100v, 150v; 20 A, I, 188; II, 1, 16, 28, 36, 51; VI, 25, 30, 101, 104; 210 A, I, 44–46, 102, 221, 273; II, 4, 10, 63, 65–67, 130–31, 222; 22 A, III; 30 A, I, 106–23; 1 CB, V, 6; VI; 516 CD, I, 8a, 9; 61 CD, Sainte-Famille, île d’Orléans, I, 4; CD, Diocèse de Québec, I, 86; II, 47; 7 CM, V, 65–71; 60 CN, I, 31, 32. ACAM, 901.012. ANQ-Q, AP-P-997; État civil, Catholiques, Notre-Dame de Québec, 24 févr. 1739. ASN, AP-G, L.-É. Bois, Succession, XVII, 5–15. ASQ, Évêques, no.159; Fonds A.-H. Gosselin, Cartons 6, 7; Fonds Viger-Verreau, Sér.O, 081, p.21; Lettres, M, 125, 126, 136, 161; P, 158, 165; R, 20; S, 6Bis, AA; mss, 12, ff.32, 34, 36, 38–47; 13; Polygraphie, XVIII, 1; Séminaire, 4, no.133; 73, nos.1, 1a, 1b, lc, 1d, 7e; 14/3, nos.3, 4. ASSM, 19, tiroir 60; 21, cartons 42, 51; 27, tiroir 94. McGill University Libraries, Dept. of Rare Books and Special Coll., ms coll., CH 193.S171.. ... “Échec de l’université d’État de 1789,” Y.-A. Lacroix, édit., Écrits du Canada français (Montréal), 28 (1969), 215–56. Mandements des évêques de Québec (Têtu et Gagnon), II, 341–502. Le séminaire de Québec (Provost), 452. Montreal Gazette, 6, 13, 27 May, 3, 10 June, 4, 18, 25 Nov. 1790. Quebec Gazette, 29 April, 13, 27 May 1790. Allaire, Dictionnaire, I, 272–73. [F.-]M. Bibaud, Le panthéon canadien; choix de biographies, Adèle et Victoria Bibaud, édit. (2e éd., Montréal, 1891), 121. Gérard Brassard, Armorial des évêques du Canada . . . (Montréal, 1940), 92. Caron, “Inv. de la corr. de Mgr Hubert et de Mgr Bailly de Messein,” ANQ Rapport, 1930–31, 199–351. Desrosiers, “Corr. de cinq vicaires généraux,” ANQ Rapport, 1947–48, 76–78, 113–23. Le Jeune, Dictionnaire, I, 773–74. P.-G. Roy, Fils de Québec, II, 65–68. Tanguay, Dictionnaire, IV, 533; Répertoire, 7, 136. Henri Têtu, Notices biographiques: les évêques de Québec (Québec, 1889), 381–407. L.-P. Audet, Histoire de l’enseignement au Québec (2v., Montréal et Toronto, 1971), I: 1608–1840. N.-E. Dionne, Les ecclésiastiques et les royalists français réfugiés au Canada à l’époque de la révolution, 1791–1802 (Québec, 1905). Galarneau, La France devant l’opinion canadienne. Lemieux, L’établissement de la première prov. eccl. George Paré, The Catholic Church in Detroit, 1701–1888 (Detroit, 1951). M. Trudel, L’Église canadienne.. ... L.-É. Bois, “L’Angleterre et le clergé français réfugié pendant la Révolution,” RSC Trans., 1st ser., III (1885), sect.i, 77–87. D.-A. Gobeil, “Quelques curés de la première paroisse ontarienne, de M. Hubert au curé A. MacDonell, Sandwich, 1781–1831,” SCHÉC Rapport, 23 (1955–56), 101–16. E. C. Lebel, “History of Assumption, the first parish in Upper Canada,” CCHA Report, 21 (1953–54), 23–37. Léon Pouliot, “L’enseignement universitaire catholique au Canada français de 1760 à 1860,” RHAF, XII (1958–59), 155–69. Gilles Chaussé, “HUBERT, JEAN-FRANÇOIS,” in Dictionary of Canadian Biography, vol. 4, University of Toronto/Université Laval, 2003–, accessed April 24, 2019, http://www.biographi.ca/en/bio/hubert_jean_francois_4E.html.